Here is a great recipe for those hot summer days. 1/5 gal (750 ml) 190+ proof alcohol, moonshine or Everclear works great. Keep in mind you can add less or more depending on how stiff you like it. Step 4 – Let cool, Add Moonshine and bottle in mason jars. I like to let this site for at least a week before drinking. The flavors really meld together by letting it sit a bit. Put the Dreamsicle Moonshine mix in the freezer for a few hours before serving. You can Either drink it over ice or toss it in the blender with some ice to make a Dreamsicle Moonshine smoothie yum yum. Add a slice of orange to the top of the glass for style points. If you’ve got a Moonshine mix recipe that you’ve made and loved post it below so others can try it! 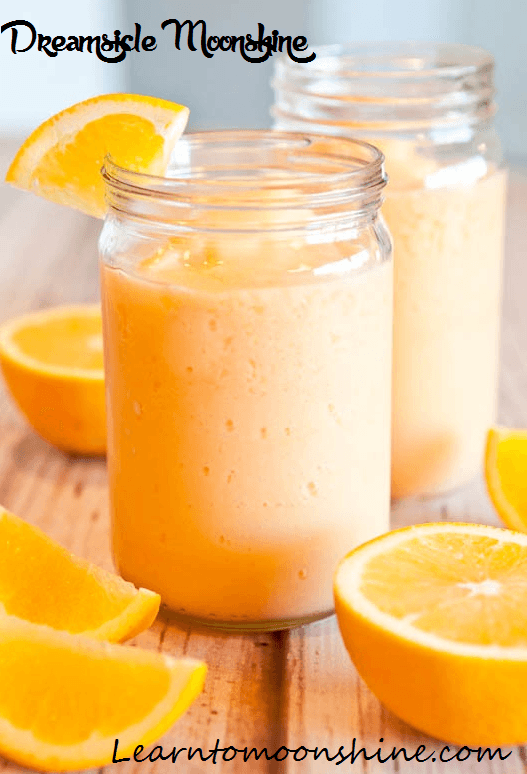 29 Responses to "Dreamsicle Moonshine Drink Recipe – Great for a hot summer day!" By using juice and creamer, does it have to stay refrigerated? Will it spoil? I’ve left it out for a month or so without it going bad. The high alcohol content does a good job at preserving it, but it’s probably not a bad idea to keep it in the fridge. Can you use regular creamer if you don’t like French vanilla? Or does it ruin the taste? I haven’t tried it with regular creamer but I would assume it would still taste great. Give it a try and let us know how it turns out ! Guess that depends if you like pulp or not 😛 .. I’ve used both and loved both. Do you have to let this sit in the fridge for 6 weeks like the apple pie? If you can let it sit for a week you’ll get the best results. Might have to give it a shake before serving as the content’s will sometimes separate depending on how long it’s been sitting! Should still be good the alcohol does a good job of preserving things! Think about Bailey’s they claim it’s got a shelf life of 2 years after opening !! How many Mason jars does this recipe use? And can you put 1/2 the jars in the fridge, and 1/2 in a cool dark place? Like hidden in the basement……haha! It will make about 2.25 Gallons or 8.5 Litres of final products. Depends on the size of the jar, I’ll let you figure that out ! Earl, lol I want your recipe! How do you get 2.25 gallons out of a gallon of OJ and 1/5 gallon of liquor? Wow ya that was wrong should of been 1.25 Gallons give or take. Love that you guys call me out on these things ha the best way to keep the information accurate is for everyone to play moderator. Thanks Thomas for noticing !! What if someone got me liquid creamer by accident. Can I use that and will still be OK in or out refrigerator? That was my question. I have liquid vanilla creamer in the fridge. I can use that instead of powder? Do you have to keep it in the fridge or can you put it in a dark cool place? I have it in the fridge now but it is taking up a lot of room. The Dreamsicle Moonshine will be sitting at around 15% give or take, as a comparison Baileys is 17 % and it holds up pretty good at room temp. The high alcohol content will act as a great preservative. So I think your fine to keep it in a cool place! Anyone else got an opinion on this ? I’ve made this is the past and taste great, but…… I’ve had trouble with the powdered creamer not dissolving correctly. Any ideas? Try heating up the mix before you add the coffee creamer.. That help ? I can’t get everclear is there a substitute for it? Just use Vodka it’s just not as strong ! Your recipe calls to use Everclear. No this recipe calls for 750 ml of Everclear. If your worried about it being to stong add less alcohol and taste it to see how strong you want it. You can always add more but you can’t take it back. why does it have to boil? i have tried a batch of this and it comes out tasting like fermented orange juice after two weeks? can I just use vodka or vanilla vodka? same amount as ever clear?